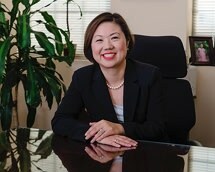 Joanne Yi is a Korean-American bilingual bankruptcy attorney with over 16 years of experience (10 years in Chicago, Illinois and 6 years in Virginia). Joanne is sincere and caring, and she makes sure her clients' needs and goals are met with the best outcome possible. With the proper guidance and advice from Joanne, many clients who filed bankruptcy (Chapter 7 or Chapter 13) have been able to receive relief from financial hardship and burden. Joanne thinks the best working relationship between attorney and client is the honest and forthright disclosure. Joanne represents clients in Eastern District of Virginia, Alexandria Division, Bankruptcy Court, which encompasses, Arlington, Fairfax, Loudoun, Fauquier, Prince William, and Stafford.